Tenneco has enhanced the Walker Emissions Control website with an improved eCatalog lookup tool designed to simplify and streamline parts searches for automotive service professionals in states that require the use of California Air Resources Board (CARB) certified catalytic converters, according to a press release. 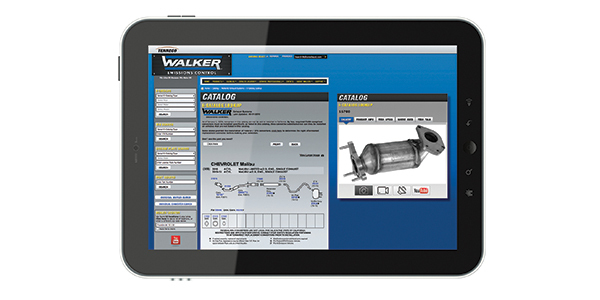 Previously, the Walker eCatalog allowed users to look up parts by exhaust system or converter type only. With the latest update, users in California, Maine and New York — where CARB-certified catalytic converters are required — can search for replacement components by selecting the relevant state for the repair from the drop-down menu. If other states transition to CARB converter regulations, they also will be added to the eCatalog, the release continued. Users can begin their eCatalog search for replacement converters by searching either application, VIN number or license plate number. They will be prompted to choose an eCatalog type from a drop-down menu with options for California, New York, Maine and “all other states.” In some cases, users will be prompted to select the correct vehicle emissions type from two options: Federal EPA or 50 State/CARB to help ensure the right replacement converter for the vehicle, the release stated. To help automotive service professionals comply with state emissions regulations, Tenneco also has developed a CARB-compliance information kit that includes a digital and printed training guide and a digital Walker CalCat converter catalog, the release concluded. To learn more about Walker Emissions Control’s offering of EPA- and CARB-compliant catalytic converters, or to request an information kit, please visit www.WalkerExhaust.com or contact your Walker parts representative.